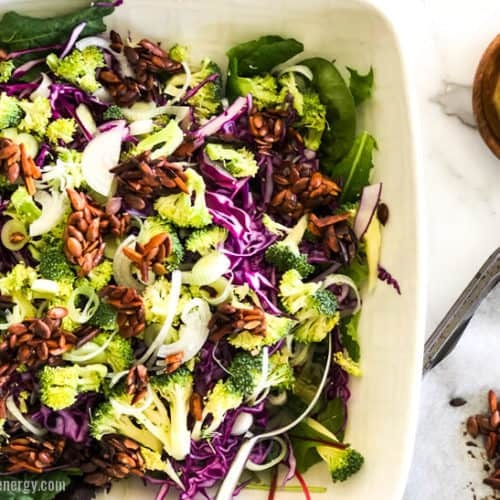 A show-stopping broccoli slaw full of fresh, healthy flavors and topped with crunchy nut clusters. Perfect to take to a party or barbecue and delight both the health conscious and the gourmet food lovers. If you’ve been asked to “bring a salad” to a barbecue, backyard party or potluck then this low-carb crunchy broccoli slaw hits the spot AND is quick and easy to prepare. This slaw recipe is bursting with fresh vegetables that will impress even the most health-conscious host but also your gourmet friends who will be wowed by the satisfying crunch of the sticky nut clusters. 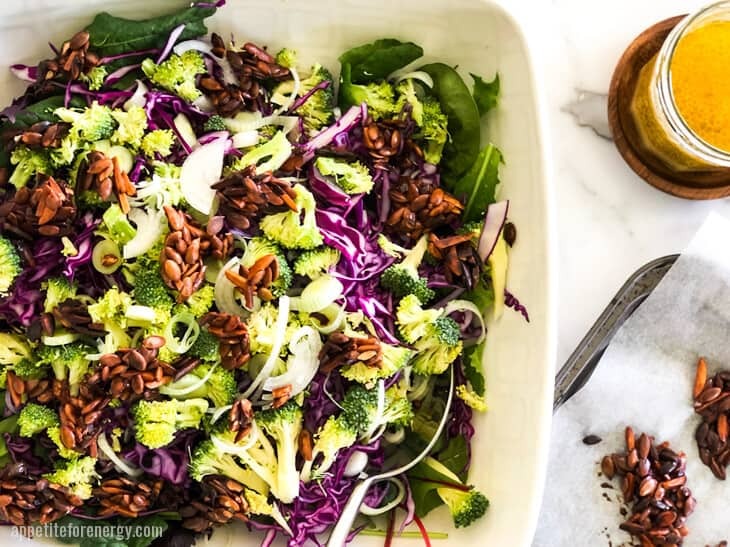 Crunchy Broccoli Slaw is low-carb & ketogenic, dairy-free, gluten-free, paleo and vegan!! As always, this fabulous entertainers salad will be ready to go in less than 30 minutes and makes enough to serve 10 as a side salad. 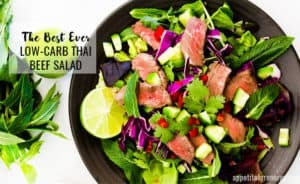 For a more substantial salad meal, try our Low-Carb Thai Beef Salad. I first came across this recipe in Taste Magazine. The original recipe contains brown sugar, cranberries, and apples so I’ve adapted it to be sugar-free and keto friendly. I tried it out for a big family lunch I was hosting and everyone loved it! 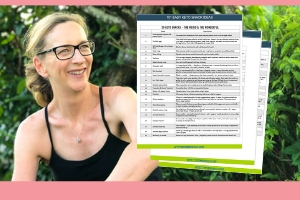 I’m finally sharing it here and I think you will love it too! What’s so great about this broccoli salad is that it is simple to make. The vegetables don’t need to be cooked, though you could steam the broccoli if you don’t like it raw. 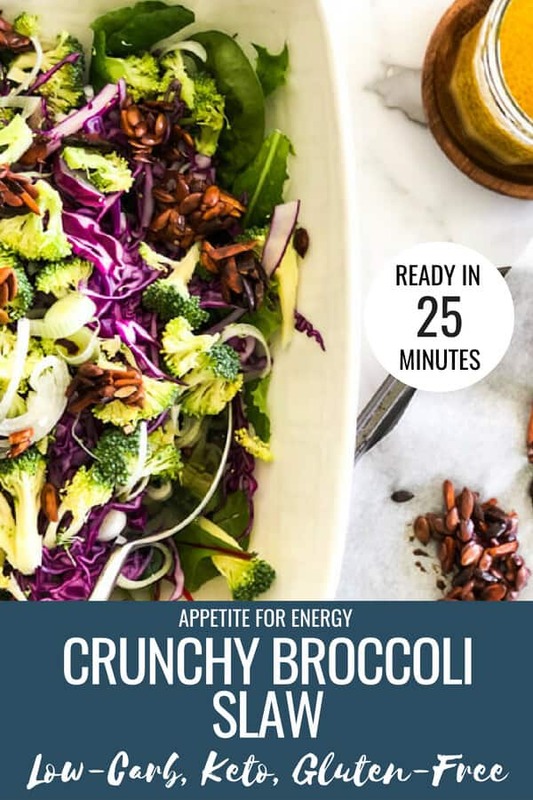 I would urge you to try it raw though as once the chopped broccoli gets tossed amongst the cabbage, leafy greens, nut clusters and vinaigrette dressing, it mixes in beautifully. The addition of the sticky nut clusters really takes this broccoli salad to the next level. They really add the WOW factor. It just takes a few minutes in a frypan to make them. I substituted erythritol for the brown sugar to create the sweet, sticky texture and it worked perfectly. 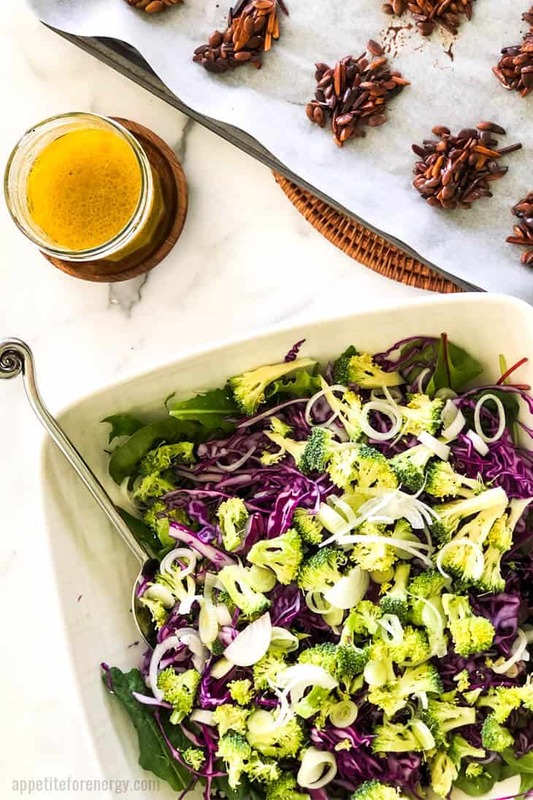 No more boring summer salads – create this Crunchy Broccoli Slaw and wow your guests and friends. Start by making the crunchy nut clusters. Line a baking tray or large plate with parchment paper. 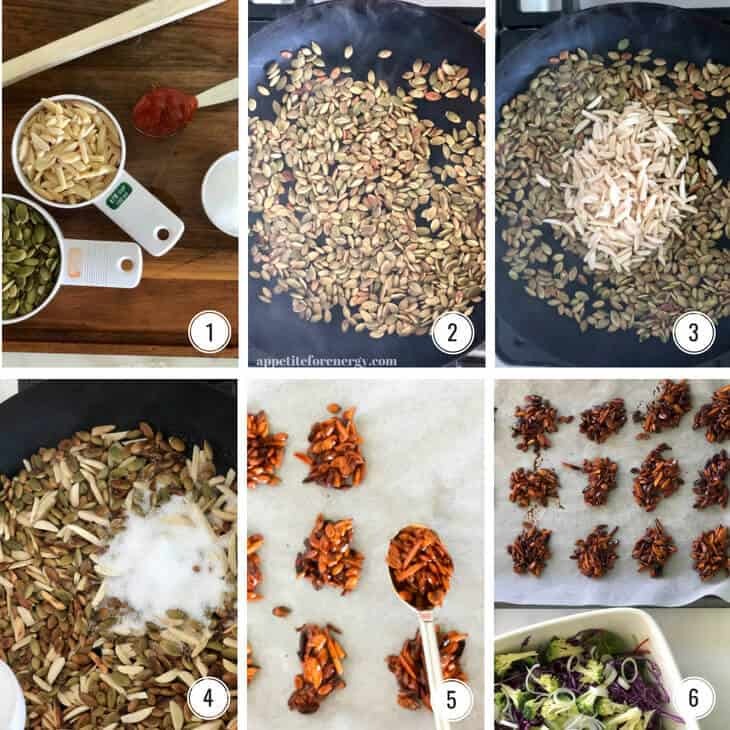 Taking broccoli slaw to a party? Prepare the dressing in a jar and add to the salad up to half an hour before serving. Take nut clusters in a separate container to be added when serving. If possible, use a food processor to shred the cabbage. You get a nice fine shred and it is very quick. If substituting for erythritol – use a granular low-carb sweetener to maintain the texture. You could use a erythritol/monk fruit mixture instead and use 1/3 less. Sriracha is a chili sauce made from chili, garlic, salt and vinegar. If you don’t have it, you could try hot sauce, chili paste or Tabasco. Instead of scallions, use red onion sliced finely. Leftovers? This salad is best eaten on the day but leftovers can be kept for a day or so in the fridge. 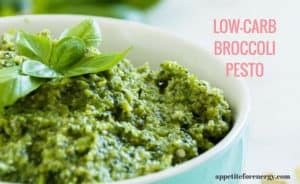 CAN I MAKE BROCCOLI SLAW IN THE FOOD PROCESSOR? You can shred the cabbage using a food processor with the shredder attachment and this gives the best results compared to using a knife. Using a food processor for broccoli is risky as it tends to break it down into a mess. The broccoli will hold together better if sliced into small pieces with a sharp knife. Scallions are a type of long thin onion also known as green onions, spring onion, and salad onion. They can be eaten raw or cooked and are often used raw to add flavor to salads. Peel off the outer green layer, slice off the end with the roots and slice the white end and a little of the green end, avoiding the leafy green part. There is a lot of confusion around the naming of these types of onions as the terms are used interchangeably by many. 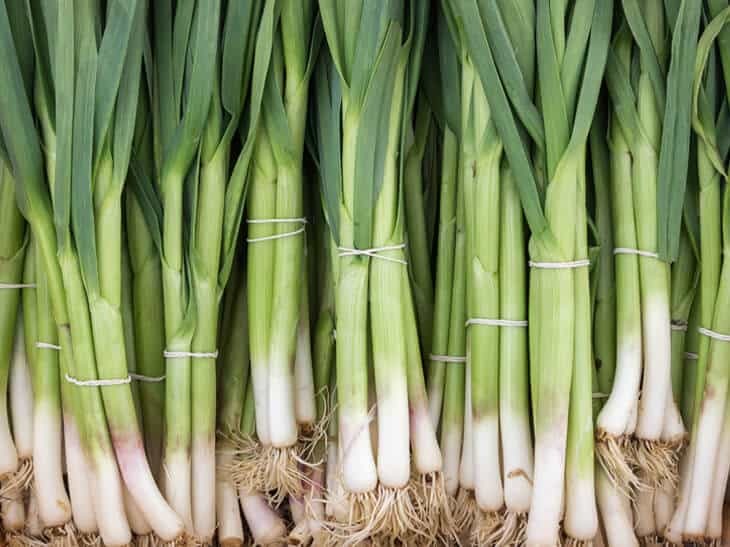 People sometimes also refer to the long onions with a large bulb as spring onions, shallot or green onions. Either the long thin onion (above) or the long, thin onion with bulb works fine in this recipe. 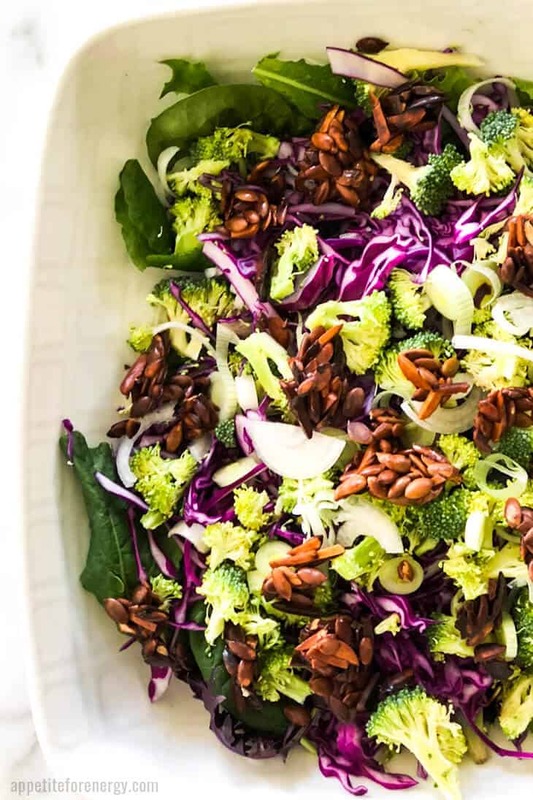 A show-stopping broccoli slaw full of fresh, healthy flavors and topped with crunchy nut clusters. Perfect to take to a party or barbecue and for low-carb & keto, dairy-free, gluten-free, paleo or vegan diets! Prepare a baking tray by lining with parchment paper. Heat a non-stick frypan over medium heat and toast the pepitas for 2-3 minutes, stirring constantly to prevent burning. When starting to brown, add the almonds and stir for 1 minute. Sprinkle over the erythritol and sriracha sauce and mix for 1-2 minutes until the erythritol is well dissolved and the mixture is sticky. Spoon the mixture into little clusters on the baking tray and allow to cool. As they cool, they will harden into crispy clusters. Combine the cabbage, leafy greens, broccoli and scallions into a large serving bowl. Add the olive oil, the vinegar and the mustard to a small bowl and whisk until combined. Season to taste. Pour the dressing onto the salad and toss well. Top with the crispy clusters. I like to eat with my eyes and they approve! Love the colors and could probably just snack on those nut clusters all day. Thanks for sharing. Those nut clusters look so yummy! i love having a nice crunch to a salad. Although with all of those fresh veggies, you have a ton of crunch going on here! Lovely! Love all the colors in the crunch broccli slow!! 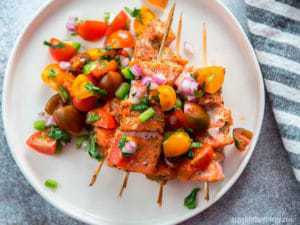 What a great dish for summer parties. Can’t wait to try this. Those little nut clusters look so good, I can imagine them being great in lots of things and bet they add a lovely crunch here. Yes, they would be great in lots of different salads or even over desserts that need a bit of crunch! 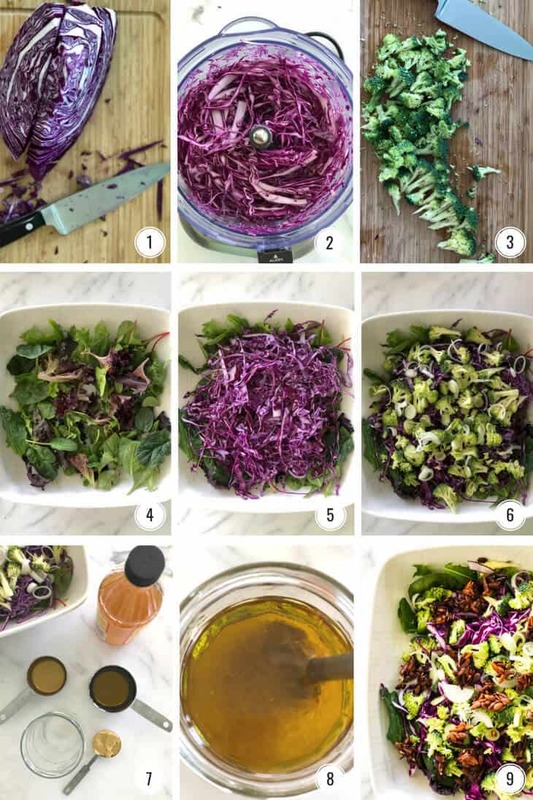 Great tips on how to make this beautiful salad. I know it will be just delicious. This is perfect for a family meal or entertaining. It’s a great salad for entertaining – I hope you make it! Yum! Those nut clusters really bring this salad to the next level! I’m liking this new way to “slaw”. I’m glad you like it! The nut clusters really lift this salad up and they’re easy to make too.